We’ve just completed the first week of rehearsals for Lisa Rosenthal’s The Good Harvest. (Click here for tickets). After an opening rehearsal that included presentations by the designers on the set, lights and costumes and a read-through of the play, we’ve been doing “table work” all week. This gives us a deep foundation in the meaning of the play and an understanding of the emotional twists and turns, scene by scene. Each night we take no more than 15 to 19 pages of the script and work through it in detail. My biggest job as director at this stage is to ask a lot of questions. My temptation is to do a lot of talking. I’ve been living with the script for a long time, collaborating with Lisa as she has done rewrite after rewrite, and I could sit and tell the actors what I think each moment means and how it ought to be played. But what I really want is to get the most thoughtful participation from each of the artists involved: every actor, every designer, every staff member–and to assist Lisa in getting the most perfect expression of her script. Asking a lot of questions has led to really fascinating insights into the script. It’s been illuminated by personal stories of giving birth, of seeing our children born and of lost opportunities for having children. The actors show tremendous emotional honesty and generosity in talking and dealing with each other. This time spent looking at lines and exploring the emotional territory will give us a rich foundation on which to build the show as we get it on its feet in the next stage. It’s also been a great pleasure to have Lisa in the room for the full process. As the playwright–who knows the script better than anyone–she has shown tremendous restraint in doing far more listening than talking. In the process, she and I are both discovering that the other artists bring insights into the script that we’ve never considered. That’s the joy of collaboration with a fully engaged ensemble. Meanwhile, I’m delighted to announce that Polarity will produce the world premiere of Ephemera by Bryce Wissel Spring 2011. This will be another world premiere of a script that has gone through development in one of our Dionysos Cup Festivals. Ephemera is a screwball comedy in outer space, aboard an endangered space station cut off from contact with the Earth. It’s really fun. On top of that, this year’s Dionysos Cup playwrights have been meeting with their directors and dramaturgs for the first discussions. The playwrights will now have the next two months to work on revisions of their scripts before the directors take them into rehearsals for the festival in May. It’s a very exciting time! The plays of this year’s Dionysos Cup include: Kabulitis by Keith Anwar. Director: Laura Sturm. 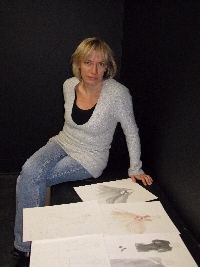 Dramaturg: Ann Keen. Death and Devils by G. Riley Mills. Director: Darren Callahan. Dramaturg: Kaily Anderson. Fertile Lies by Jaime-Lee Wise. Director: Brea Hayes. Dramaturg: Richard Engling. What Makes the Buddha Smile by Jay Koepke. Director: Sean Kelly. Dramaturg: Jamie Bragg. Production managers: Lauren Cerkiewicz and Jamie Bragg. You are currently browsing the Polarity Ensemble Theatre Blog blog archives for February, 2010.